Thanks to Aaron from Streetsblog San Francisco we have something easy and quick to blog here on Sunday. 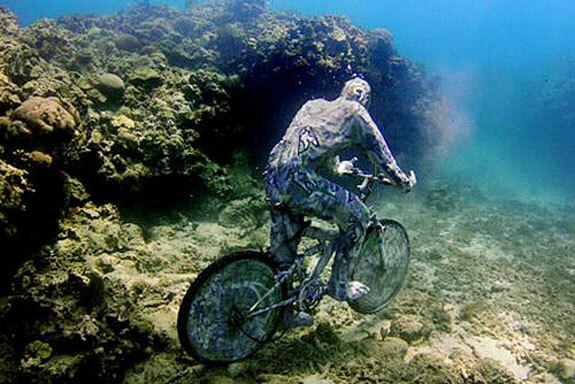 A new underwater sculpture museum off the coast of Cancun features what Aaron called "an underwater Citizen Cyclist statue". I'm sure Cancun lives up to the dream of tropical holidays for many but personally I find it hard to take a place seriously when its location was determined by a computer programme when the developers were planning Cancun. I read that in Taras Grescoe's 'The End of Elsewhere: Travels Among the Tourists' (2003).